Kristine Barnett's son Jacob has an IQ higher than Einstein's, a photographic memory, and he taught himself calculus in two weeks. At nine he started working on an original theory in astrophysics that experts believe may someday put him in line for a Nobel Prize, and at age twelve he became a paid researcher in quantum physics. But the story of Kristine's journey with Jake is all the more remarkable because his extraordinary mind was almost lost to autism. At age two, when Jake was diagnosed, Kristine was told he might never be able to tie his own shoes. The Spark is a remarkable memoir of mother and son. Surrounded by "experts" at home and in special ed who tried to focus on Jake's most basic skills and curtail his distracting interests—moving shadows on the wall, stars, plaid patterns on sofa fabric—Jake made no progress, withdrew more and more into his own world, and eventually stopped talking completely. Kristine knew in her heart that she had to make a change. Against the advice of her husband, Michael, and the developmental specialists, Kristine followed her instincts, pulled Jake out of special ed, and began preparing him for mainstream kindergarten on her own. 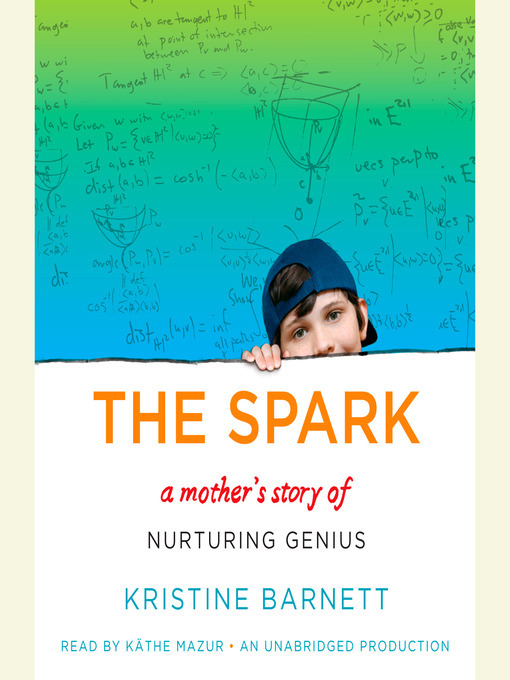 Relying on the insights she developed at the daycare center she runs out of the garage in her home, Kristine resolved to follow Jacob's "spark"—his passionate interests. Why concentrate on what he couldn't do? Why not focus on what he could? This basic philosophy, along with her belief in the power of ordinary childhood experiences (softball, picnics, s'mores around the campfire) and the importance of play, helped Kristine overcome huge odds.